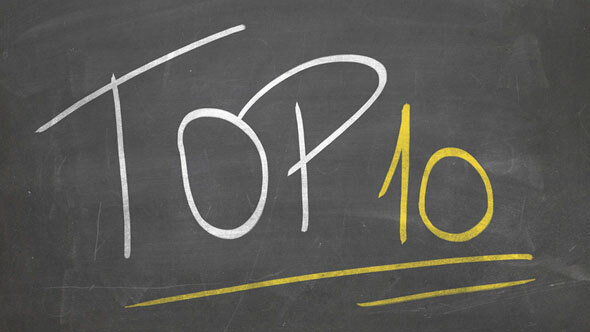 On Vacation out of country next week, Top 10 sporadic at best. 1.Chart of Tech Bubble? No Cash…Investors Pouring into Short-Term Fixed Income. The Most Hated Stock Bull Ever….MINT short-term assets doubled in 1 year. In recent months, this “use for cash” story has been playing out strongly in the ETF space, as retail and institutional investors pour assets into ultra-short-dated bond funds. These ETFs are considered alternative cash management tools because they typically deliver higher income than money market mutual funds. They are also good risk management tools for investors worried about interest rate risk. And they can even be a type of defensive play if you want to have cash at hand in the event of a market sell-off—these ETFs offer strong daily liquidity, as in quick access to that cash. 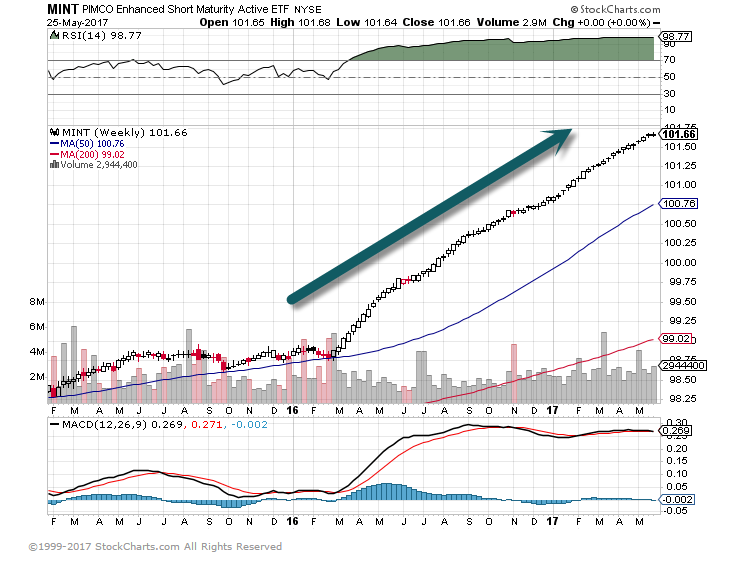 The most popular of these strategies, the PIMCO Enhanced Short Maturity Active ETF (MINT), is almost twice as big today as it was a year ago, with almost $7 billion in total assets. It has seen tremendous growth. So far this year, MINT has attracted more than $1.3 billion in net creations, making it the largest actively managed ETF. Other ETFs in this segment benefiting from this demand include the iShares Short Maturity Bond ETF (NEAR), gathering some $255 million year-to-date, and growing to become a $2.5 billion fund—now the market’s third-largest actively managed ETF. 2.Dividend Stocks in Rising Rate Environment. Consider new sources of income High dividend payers have become quite expensive in comparison to the broad US market and may come under pressure as rates rise. In a rising rate environment, dividend growers could potentially outperform high dividend stocks based on their more reasonable valuations (source: SocGen, based ion the MSCI World Index quarterly annualized real returns between 3/31/86 and 3/31/15) . 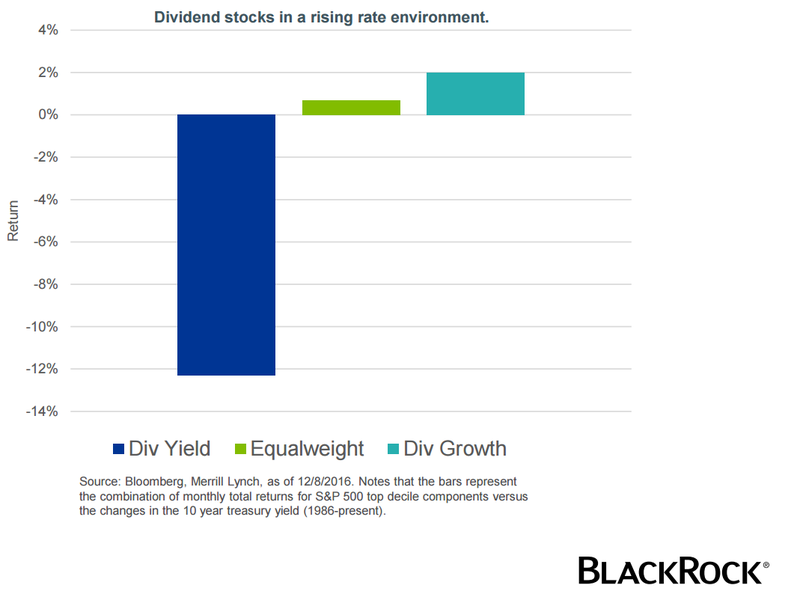 In contrast, a dividend growth strategy may offer: • A higher allocation to cyclical sectors that have the potential to grow alongside the economy. • Exposure to companies that have the potential to sustainably grow and increase dividends over time. 3.China Re-Pegs to Dollar After Moody’s Debt Downgrade. The close alignment with the dollar could ease the threat of a trade war with the U.S., after President Donald Trump claimed China has exploited weakness in the currency at the expense of its trading partners. Mr. Trump recently refrained from labeling China a currency manipulator. The steadier yuan, coupled with more restrictions on money leaving China and higher interest rates, has calmed investors and helped keep money onshore. 4.Is China on Cusp of the American Dream? Debt Bomb or American Dream? How China is like the post-war U.S.
Like the U.S. in 1950, China is already an industrial and economic power. It has been the world’s manufacturing centre for over a decade. And China is home to the world’s second-largest economy. It also has the world’s largest middle class. It’s expected to be over half a billion people by 2020. This booming middle class is also earning more money and has more disposable income – just like the baby boomer generation that started taking shape in mid-20th century America. And the Chinese government, like the U.S. government in the 1950s, is encouraging Chinese consumers to buy more stuff, for the good of China’s economy. So, even though China’s economic growth has been miraculous for the past 20 years, it isn’t over yet. To give you an idea of the “opportunities to come,” look at the chart below. The black line shows the extraordinary growth in GDP per capita in the United States from 1960 to 2015, when America was the engine for the global economy. During that time, GDP per capita in the U.S. grew 1,757 percent. 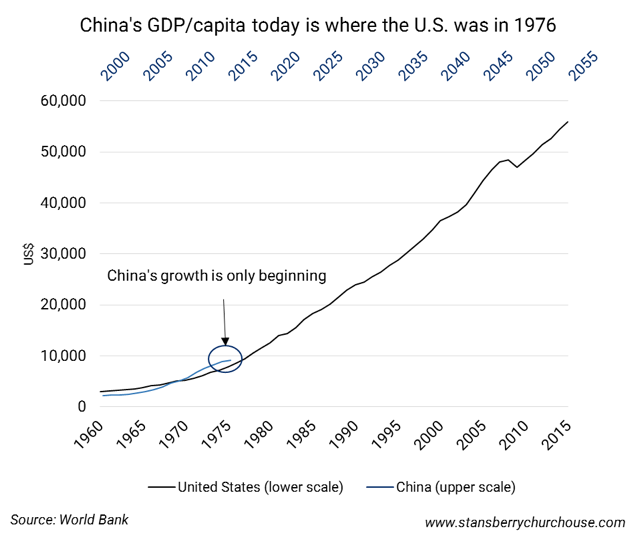 The red line represents China’s GDP per capita from 2000 to 2015 (using the x-axis at the top of the graph). Notice how closely it tracks America’s historical growth from 1960 to 1976. 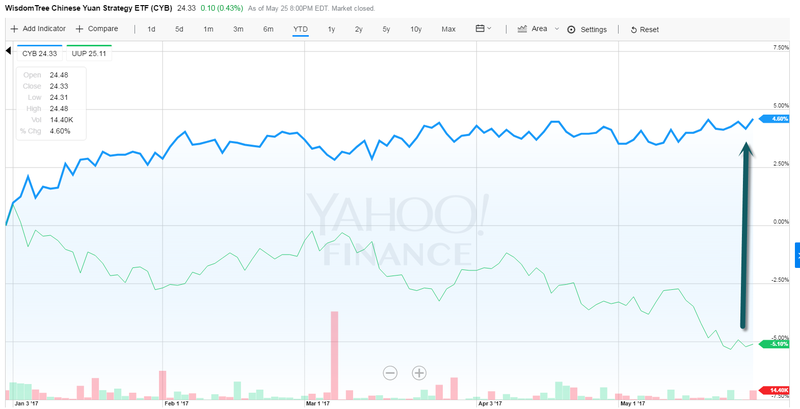 (Bloomberg) –It’s Investing 101 — don’t chase performance. But that’s just what buyers of smart beta exchange-traded funds have been doing for the past month. For the first time in nearly four years, value ETFs have become the most shunned smart beta investment in the exchange-traded universe. BlackRock Inc., the biggest purveyor of smart beta ETFs, thinks some investors are making a classic mistake of chasing returns in growth stocks rather than following fundamentals. 6.Pretty Soon Electric Cars Will Cost Less Than Gasoline…Energy down for a lot of reasons outside OPEC. 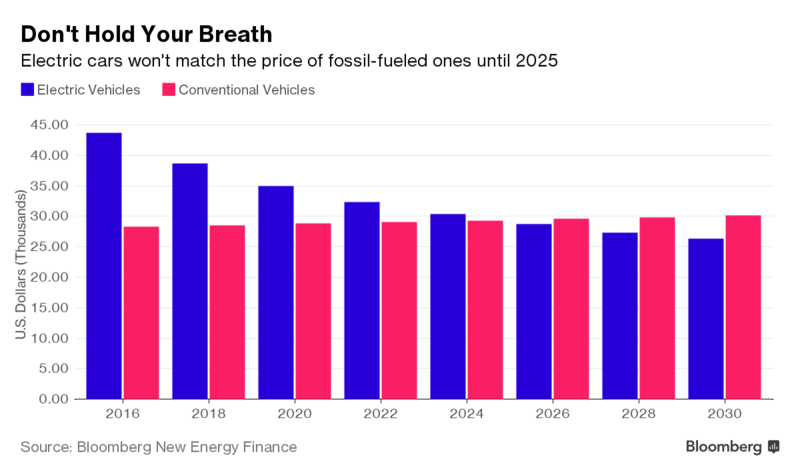 Bloomberg New Energy Finance sees electric cars becoming cheaper than conventional vehicles by 2030. 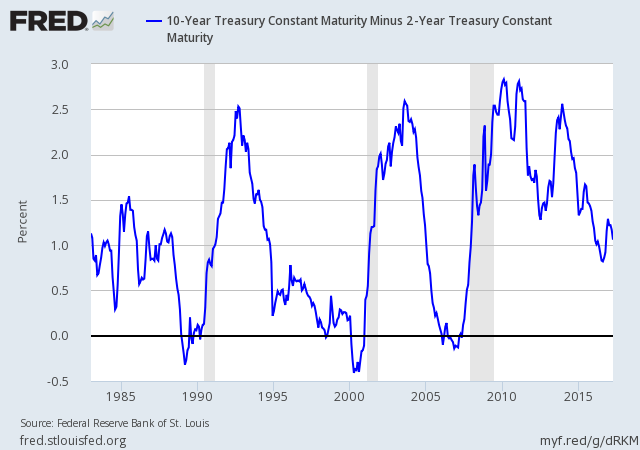 7.Yield Curve #1 Recession Watch Chart…See 1990, 2000, 2007 Inversions on Chart. 10 Year minus 2 year not near inversion yet. 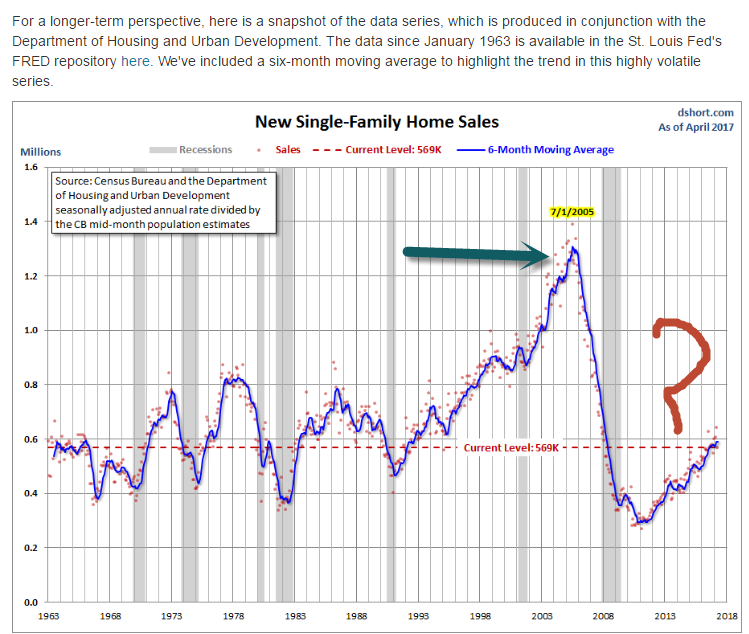 8.New Home Sales…Green Arrow Baby Boomers Housing Bubble….Question Mark Gen Y 1/3 Larger than Baby Boomers. But even accounting for those things, operators on both sides of the war distinguished themselves with daring missions. The “Cockleshell Heroes” were a group of British Royal Marines assigned the task of launching from a submarine and canoeing miles up the River Gironde to place limpet mines against the hull of German ships. The mission hit problems almost immediately as canoes were lost to tide and river obstacles. Only two of the original five made it to the Bordeaux-Bassens docks. The four men who crewed the canoes placed mines on a few ships, which damaged some commercial vessels. While the material damage was limited, it boosted British morale and forced the Germans to devote more resources to defense in a way similar to the U.S. Army Air Force’s Doolittle Raid. Operation Flipper had the lofty goal of crippling an Italian headquarters and intelligence office as well as killing Field Marshall Erwin Rommel. The mission was beset by bad weather and the assault force that hit the German officer’s headquarters was smaller than planned. Still, the British commandos broke into the headquarters building only to learn that Rommel had been delayed in Rome by his own weather problems. Only two raiders survived, but even Rommel admitted that it was a “brilliant operation.” He had the senior officer, British Lt. Col. Geoffrey Keyes, killed and buried with full honors and photos sent to the family. A first attempt on the Norsk Hydro Plant, where radioactive heavy water was processed and stored, failed but the survivors and their reinforcements hit the plant on Feb. 28, 1943, despite suffering from starvation and exhaustion. They were able to blow the storage facilities, setting German nuclear research back by at least months. Months later, a new stockpile of German heavy water was being transported on a ferry when the Norwegian Resistance attacked once again, sinking the ferry and ending Germany’s last best chance at a nuclear reactor or bomb. One man, Knut Haukelid, participated in both raids. In 1940, the Belgian Fort Eben-Emael was arguably the world’s strongest fort. Constructed from 1932-1935, it was heavily armed and guarded by upwards of 800 soldiers. But Germany had to destroy or negate it to get the blitzkrieg into Belgium. 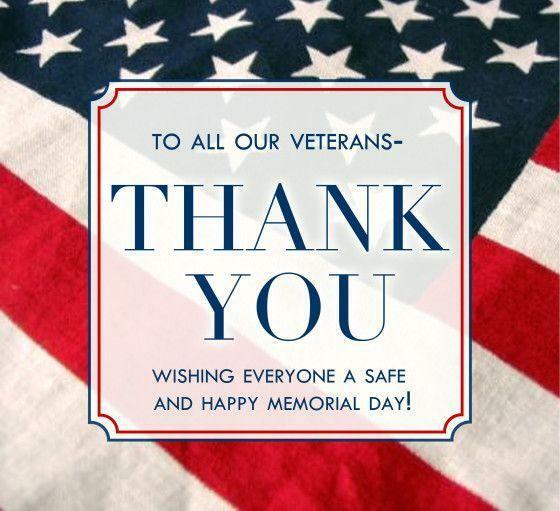 They did it in a single morning with 85 paratroopers. The men landed on the fort in gliders and quickly took hold of large sections of it, destroying or capturing the guns aimed at the countryside. When the rest of the German army arrived, the remaining defenders surrendered. In July 1943, Italian defeats turned the country against Benito Mussolini and he was exiled to a series of locations. A German commander was able to track the dictator to Gran Sasso, a mountaintop ski resort accessible only by cable car or glider. At 6,300 feet, it was too high even for an airborne assault. German Capt. Otto Skorzeny led the glider assault. The paratroopers brought along an Italian general in the hopes that he would prevent a shootout. It worked. The Italian guards decided not to fight when the gliders crashed into the mountains and the paratroopers stormed out. Skorzeny and Mussolini departed on a small, high-altitude plane. The insane plan for Operation Biting called for five groups of British paras to land in German-occupied France, capture a German radar station, and then make off with key pieces of the technology. The men landed under cover of darkness and quickly captured the building. They even managed to grab two technicians with intimate knowledge of the advanced German radar. Paratroopers who missed their drop zone arrived late to destroy a German pillbox, a situation that almost ended with the withdrawing commandos being killed. Luckily, the men arrived in time to destroy the pillbox as it swept fire on the other commandos. The British escaped with their prize. Dubbed the “Greatest Raid of Them All,” the St. Nazaire Raid targeted the only German-held dry dock for heavy ships on the Atlantic that was accessible without passing German defenses. But the dry dock was heavily armed and far upriver. The British sent a small flotilla of vessels led by the converted HMS Campbeltown. Sixteen were small motorboats, twelve of which were destroyed without reaching shore. But the Campbeltown managed to ram the gates of the dry dock. The Germans captured 215 of the 600 attackers and killed 169 more, but explosives hidden in the Campbeltown exploded the next morning, crippling the facilities. Read the original article on We Are The Mighty. Copyright 2017. Follow We Are The Mighty on Twitter. If you ever feel like you don’t get enough done in the day, it’s because you’re doing what you should never do in the morning. This lack of progress is the greatest source of demotivation. It’s why employees quit, small businesses fail, and why we are tempted to give up on our dreams. Here’s a scary thing to do. Add a time tracker application to your computer and mobile phone that can tell you how much time you spend each day on every website you visit, from Facebook to Instagram to CNN.com, TheDrudgeReport.com, and even your bank account. You can also use this free Time Tracker sheet. Add another program to your computer called Internet Freedom. This app can block you from visiting certain websites or from using the Internet at all during certain times. With these new boundaries in place, you’ll have made time for what matters. These are the 5 secret habits missing from so many of my client’s morning routines, and possibly from yours, too. But when you follow all of these NOT to-do rules, you’ll protect yourself from the time-management pitfalls holding you back in life. That’s the promise of The Perfect Day Formula book & kit. And today we have a special offer for you on our 2.0 kit— the revamped product of thousands of hours of improvements. The tools in this kit were primed to boost your wealth-building habits and productivity. And we can all use more of that! Be one of the first 50 people to try the new kit! Go here to see the improvements we made over 1,000 hours of redeveloping.